Our sincere appreciation to Upland United Methodist Church member, Mr. Ralph Johnson, Upland, PA, for contributing the following information from the 105th Anniversary and Homecoming booklet from October 17, 1971. Rev. G. W. North, 1898-1900? * = These former pastors participated in the 105th Anniversary/Homecoming on October 17, 1971. "Rev. David A. MacQueen will bring greetings from our sister church, Upland Baptist." "Rev. George L. Overley will bring greetings from our mother church, Madison Street United Methodist, Chester." "The following "Historical Sketch" was copied, word for word, from the booklet in commemoration of the 50th anniversary of the congregation and the 43rd anniversary of the original church building (October 1916)." Any historical sketch of the Upland Methodist Episcopal Church that we may give at this time must of necessity be incomplete. The data which we have been able to obtain thus far has been rather meagre. Unfortunately, the early records of the church have been lost, and after careful inquiry, we have been able to secure but a limited number of facts. Prior to the year 1866 occasional religious meetings were held in the homes by people of Methodist proclivity. At this time the Baptist was the only Church in the town. In the year 1866 the religious work by the Methodists in Upland assumed a more definite form, and a Society was organized, under the guidance and with the active assistance of the Rev. H. E. Gilroy, Pastor of Madison Street Methodist Episcopal Church (1866-'69). From this time on, or until the erection of the new church building, the work here was carried on as a Mission, under the auspices of the Madison Street Church. 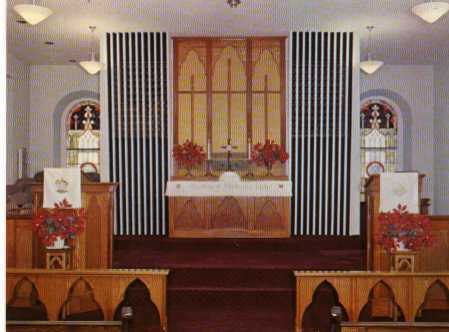 The Upland Church, therefore, may properly be considered a child of the Madison Street Methodist Episcopal Church of Chester, PA.
At the beginning, as was the custom in those days, the work was carried on through Class Meetings. In the later part of 1866 there were three Class Meetings held regularly, under the leadership of Joseph Abbott, James Buckley and George Mack; the three Classes occasionally meeting together. The Rev. James Cunningham, Pastor of Madison Street Church (1869-'72) lent active support to the work at Upland. The Society at first held her meetings in the homes of members, and then for a short time in an old stone building up the Race, used as a school house, and owned by the late J. P. Crozer, Esq'r. From there the Society moved into the public school building on Sixth Street, where she continued to hold religious services for about three years. From thence she moved to the upper room of the new Hill Street Public School building, where a gracious revival of religion broke out, resulting in the conversion of about 125 persons. Here the Society continued to meet for about a year. Being crowded out of the schoolhouse, the Society moved to Pretty's Hall, on Upland Ave., where she continued to meet for between one and two years, or until the Church building was erected. Here another gracious revival of religion broke out under the Pastorate of the Rev. J. B. Maddux, Pastor of Madison Street Church (1872-'75) which resulted in over 100 conversions, and which proved to be the real incentive for the erection of a new Church building. At a special meeting of the Society held on August 21st, 1873, by a unanimous vote it was decided to build a house of worship on the lot on which the Church now stands. This lot, 100 feet square, at the South West corner of Church and Eighth Streets, was donated by William and John Maris. Legal title was taken to the property November 28th, 1873 by Edward Morris, Henry Marshall, Joseph Buckley, George Mack, Wm. Alcutt, Wm. Howard, Joseph Abbott and John Saunders, acting as trustees for the Methodist Episcopal Church of Upland. The Church Society was incorporated and a charter was granted under the laws of Pennsylvania, April 29th, 1874, - and the following were the first trustees under the new charter: - John L. Saunders, John Blythe, Robt. Lee, Chas. M. Smith, Henry Marshall, Wm. Howard, George Mosley, Benjamin W. Clark and James Weaver. This charter provides that an annual meeting of the members of the Church, over 21 years of age, shall be held in the Church between the hours of seven and nine P.M. on the second Monday of January, each and every year, for the election of new trustees. The corner stone of the new Church was laid at 5:00 P.M. on Saturday, Oct. 11th, 1873, by the Rev. Wm. McCombs, Presiding Elder, and the Rev. J. B. Maddux, Preacher in charge. The Church was dedicated on Sunday, April 19th, 1874. The original Church building had steps on the outside leading to the second floor or auditorium. In 1882, under the Pastorate of the Rev. Nathaniel Turner, these steps were removed. About fourteen feet were added to the Church and appropriate stairways were erected on the interior of the building. The following men have entered the Christian Ministry from this Church: Rev. Isaac Carr, Rev. George Mack and Rev. James Buckley; and from this Church went forth Miss Annie Rollins into the Missionary work. We have ascertained that the following Charter members of the church are still living, and retain their present membership in our Church Society: - Mrs. Margaret P. Lancaster, Mrs. Jane Smith, Mrs. Anna E. Chalfant, Mrs. Mary Cohen and Mrs. Sarah A. Hannum. Among those who came in shortly after the organization of the Church, and still remain with us, are: Mr. John T. Egan and Mrs. Elizabeth O'Bryan, each now in the 86th year of their age, and Mr. and Mrs. J. P. Carey. The parsonage was built in 1880, under the Pastorate of the Rev. John D. Fox. On account of the illness and subsequent death of Mrs. Fox, prior to the completion of the building, Brother Fox and family never occupied the new parsonage. The parsonage was rented for about six months, or until Conference time, when the Rev. Nathaniel Turner was appointed to the charge. He was the first Preacher to occupy the new parsonage. Under the present Pastorate all the latest sanitary fixtures and improvements have been installed in the bath room, and a new Sunshine Range, a porcelain sink and tray in the kitchen. The kitchen has been enlarged, and the outside porch has been enclosed and made into a laundry. All of the above improvements have been paid for. Ralph Johnson recalls that Rev. MacQueen reported, "that the parsonage house, three story single, unattached, was built for $1400 around 1890." The final service was held at Upland United Methodist Church on Sunday July 13, 2003. � 2000, 2003, 2006 John A. Bullock III.